The Happiest Baby on the Block techniques. We were given both the DVD and the book, and the soothing techniques Dr. Karp teaches have been sanity-savers. We use the “Five S’s” all of the time. Evy cannot sleep without being swaddled but her strong arms break free of most swaddles- the swaddling method Dr. Karp teaches is one of the few she has trouble breaking out of. 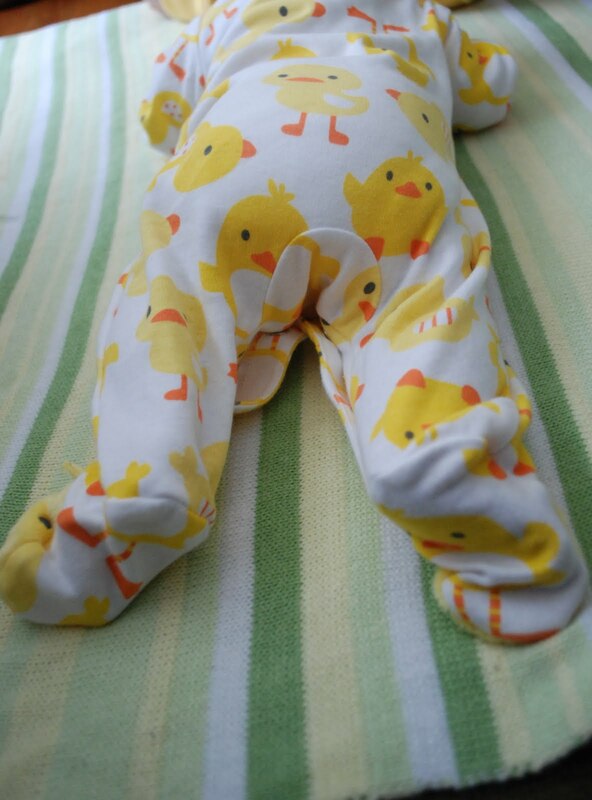 Swaddle Designs swaddling blankets – nice and big, and they last multiple uses without getting stretched out. A lot of people like the Aden & Anais blankets, but at least now while Evy is still tiny these just don’t wrap tight enough. They stretch out after one or two uses and she is able to get those arms out. I do think they’ll be more useful when she’s a little bigger. Carriers. I am officially a convert and a strong believer in baby wearing. We received an Ergo and infant insert as well as a Baby K’tan as a gift, and I just purchased a Sleepy Wrap (I totally understand how people end up with 20 different baby carriers….). It’s amazing how being worn calms Evelyn down if she’s fussy. Today has been a fussy day (she got a shot yesterday, so I blame that)- she’s currently sleeping on me in the Sleepy Wrap. She prefers being held over all other options- I certainly don’t mind the snuggle time, but it makes it hard to do anything else, including important things like eating. Putting her in a carrier makes her happy while letting me have my hands free. I’ve used all of the carriers around the house, and I’ve used the Ergo on walks. I can definitely see using all of them out and about. My iPhone. For keeping track of nursing (I’ve been using the iBaby Feed app, which is great) and for keeping me entertained and connected to the outside world when the babe wants to nurse often and for an hour at a time (iBaby Feed tells me I’ve been spending an average of 7 hours per day nursing, oy). Especially helpful for keeping me company during those middle of the night feedings. I’m sure I’m ruining my already terrible eyesight even further. Baby swing/bouncy seat– At least one of Evy’s naps each day is in the swing, and she’ll often hang out in there while we eat dinner. She likes the motion, and the built-in nature sounds help her fall asleep. Our swing (linked to) is also a bouncy seat- she’ll hang out in that in the bathroom while I shower or upstairs when I have things to do in our room. Sleep Sheep – A cute little white noise machine. We have the smaller travel sheep, I think the big one has more sounds. White noise is also part of the Happiest Baby on the Block methods, and it so works. Ocean sounds help Evy fall asleep each night (and since her bassinet is right next to our bed, they help her mama make the most of those few hours of sleep, too!) The swing also makes nature sounds, helpful for her naps. With the help of the above– and our very supportive families– we’ve been doing really well. The first two weeks were extremely hard – I definitely cried along with Evy on more than one occasion. Things have steadily gotten better. There still isn’t a lot of sleep in our lives, but we have a routine that lets both Pat and I make the most of the sleep we’re able to get. We’re getting to know her cries and her signals and how to meet her needs. I love being a mom, I love seeing Pat as a dad, and I am head over heels for Evelyn. Right now I’m just doing my best to enjoy every moment.